Negative-Positive Space and Plants of the Wayside Shrine Trail is a 2D studio project based on the plants of the Wayside Shrine Trail. Students also explore negative and positive space as a design element. View step-by-step instructions of the above project. Download the Power Point for Positive and Negative Space and the Plants. 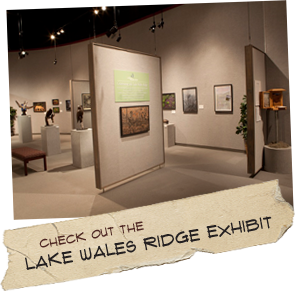 Students will study three works from the Lake Wales Ridge Exhibit and use the Feldman Process of Critique to further understand the works. The Practicing Art Criticism lesson is a great introduction to critiquing art. Download the PowerPoint for Practicing Art Criticism. Although the Power Point is mostly teacher centered, there is room in the presentation for student participation. Directions for creating a Three-hole Booklet can be used in classes and workshops from middle school through adult. Use the booklet as a nature journal on the Wayside Shrine Trail for writing, sketching, and rubbings. The booklet can also be used with the Wayside Shrine Eco-Journal.